Desperate not to be outdone by SwindonWeb's Office Olympics, the Corporate Games was royally opened today at Lydiard Park. 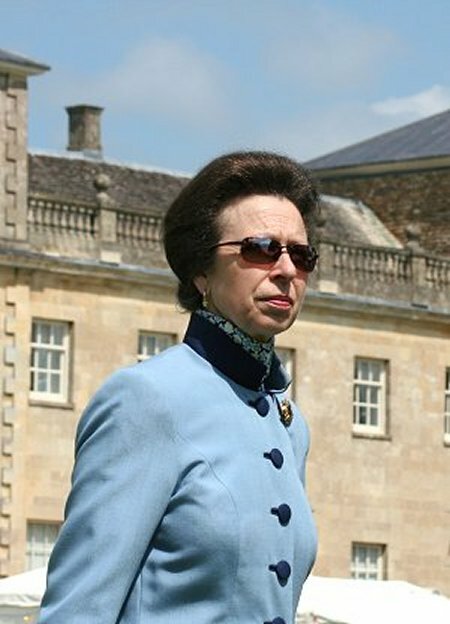 Princess Anne, Honorary Patron of the 2006 Games, was the guest of honour at the official launch of the competition which combines the worlds of business and sport. 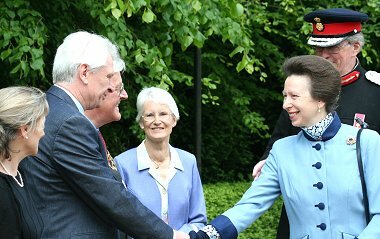 Decked in a pale blue jacket and skirt and navy gloves, the Princess spoke to the crowds who had turned out in their hundreds in the beautiful sunshine that organisers had hoped for. 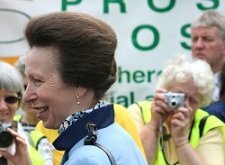 "It is my pleasure to officially open the UK corporate games here in Swindon," said Her Royal Highness, struggling to be heard over an over-zealous crowd who cheered at every mention of their home town (we blame the Adver's Swindon and Proud campaign!). She also congratulated Swindon for the successful bid and the organisation of the event so far. "This whole event will give you something to look back on as an achievement," she added. "The Corporate Games is very much about using all sorts of different influences to bring people together. Sport is a major part of that and also inspires major improvements in other areas like Lydiard." 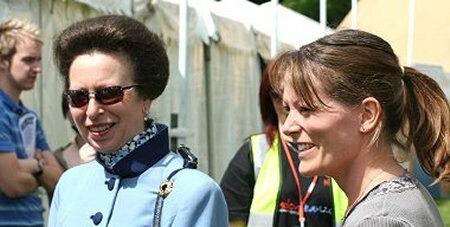 The Princess then took a lengthy tour of the park, meeting the many organisations and individuals who have helped make the event happen. 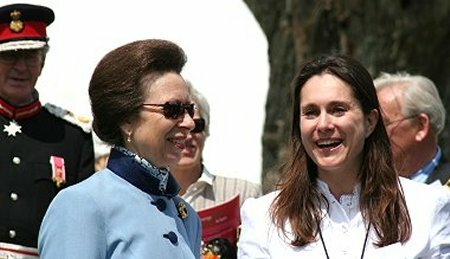 Among those to partake in a royal chat was Fiona Strange, Team Presenter from Nationwide, one of the main sponsors of the event since 1992, represented by 300 athletes. "She was very nice and was keen to meet some of the people competing in the netball, golf and athletics events," said Fiona. "She was also interested in how we have managed to accommodate all the athletes in Swindon, clearly aware that there aren't too many hotels in town!" "I told her that we are using a training centre at Wanborough, although there had been talk of a campsite to accommodate a lot of the athletes. In total the Games are bringing over 6,000 competitors to Swindon - more than took part in this spring's Commonwealth Games in Melbourne. Among the hundreds of companies represented from all over the UK, there are 140 Swindon firms taking part in the 21 sports, which include hockey, tennis, cricket 8's and tenpin bowling. RWE npower are likely to be the best represented. The energy company have won the cup for the most entrants for the past two years, and have once again fielded around 600 competitors. Not to be outdone, hosts Swindon Borough Council have entered the largest civic authority team the Games have ever seen. Roderick Bluh, leader of Swindon Borough Council, said, "I am delighted Swindon Borough Council has entered a team of almost 300 into the Games and look forward to supporting our sportsmen and women. "At the council we believe the health and well-being of staff is vital in creating a vibrant and happy working team." The Borough Council are hosting a festival of entertainment at the hub of the Games at Lydiard. Attractions include bands playing music for all tastes and roaming entertainment including circus and theatre groups. It is a credit to Swindon that this is the grandest and by far the most accessible Corporate Games yet. For the first time ever the Games are open to the public and organisers are expecting up to 6,000 spectators to turn out, matching the number of competitors. Mike Bowden, executive director of npower and chairman of Swindon Economic Development and Enterprise Partnership, has played a key role in the organisation of the Games. 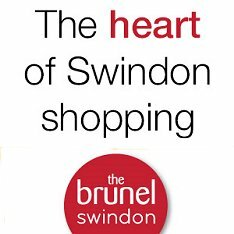 "Right from the outset, all those involved with Swindon's bid wanted to make 2006 a year to remember and include all the residents of Swindon as well as the business community in this great event," he said. "For RWE npower I regard the ability to bring so many of our companies together at the Games as a great opportunity for team building and social interaction."